Our pupils are “happy at school and enjoy their learning,” according to Ofsted. 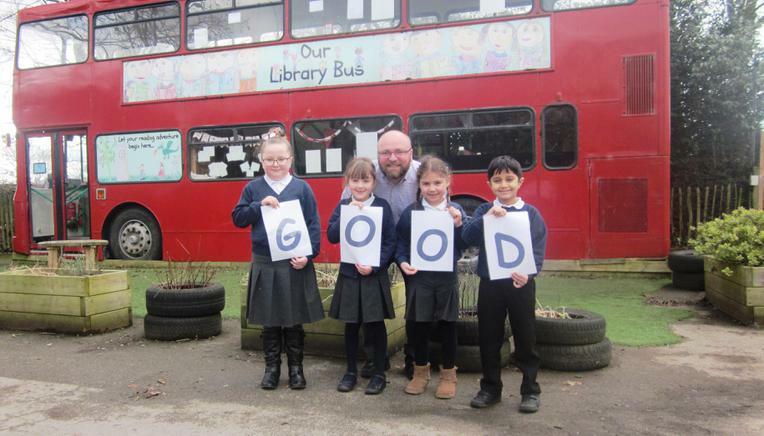 Inspectors praise the school’s “vibrant environment which motivates pupils and supports their learning” and highlights the “innovative use of space and resources” - with a special mention for our London double decker bus converted into a library which is described in the report as “a shining example”. Inspectors judged teaching across the school to be good and acknowledged recently introduced new approaches to teaching phonics and mathematics. The report highlights the “many ways” that the school promotes attendance and supports families experiencing difficulty getting their children to school regularly, but inspectors have said the school should “keep seeking new ways “ to reduce absence. Head teacher, Andrew Moorcroft (pictured with Year 2 pupils) is delighted with the report and says it acknowledges the dedication of staff and governors who have worked tirelessly to address the areas identified for improvement after the school’s previous inspection in July 2012. “We pride ourselves on being a forward-thinking school where children are happy learners and it is very pleasing to have this confirmed by Ofsted,” he says. “It is our mission to ensure that all pupils make outstanding progress and achieve their potential and we are continually looking at new ways to make sure this happens,” he adds.